The Gloster Gladiator occupies an important place within the history of the RAF. 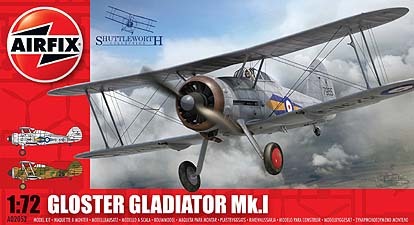 The last of the RAF's biplane fighters, the Gladiator had some modern features, such as an enclosed cockpit, a first for an RAF fighter, as well as an armament of four machine guns. Still in service at the outbreak of the war, the Gladiator proved to be a capable biplane fighter, but was outclassed against modern monoplane opposition. The mount of some the RAF's most famous pilots, such as Pat Pattle and Roald Dahl, preserved Gladiators can still be seen flying today at Duxford and Old Warden air displays.